Save up to 25%. Book now and enjoy the greatest facilities in Isla Mujeres! With this package you will have the opportunity to enjoy the greatest facilities in Garrafon Natural Reef Park on its deluxe version and with the most comfortable privacy of the island. Get a complete access to our new exclusive zone, designed for the greatest confort and wellness. Get a personalized service in an exclusive area with all the facilities, such as "The View" restaurant, pool and lounge chairs. 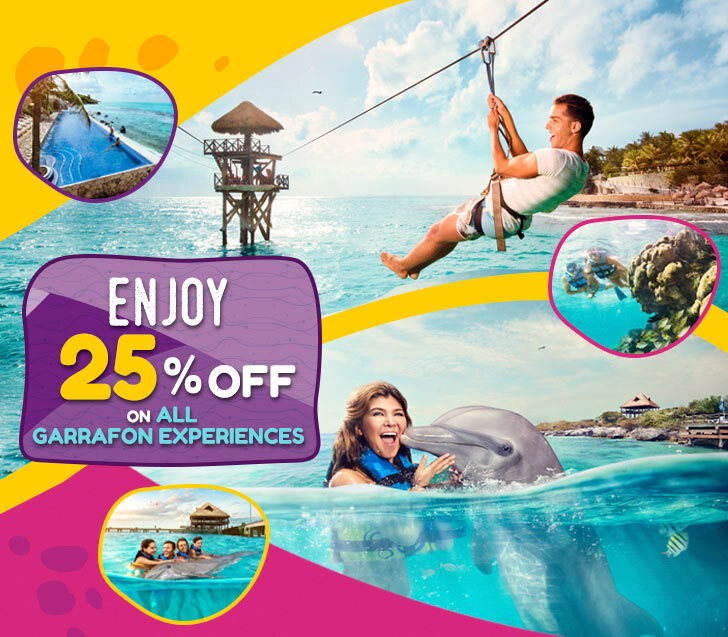 Besides, you can enjoy the rest of the facilities and activities of the park, including snorkeling in one of the most important reefs of the world, kayaking and an amazing experience in the zip-line. Your VIP experience includes an international open bar and food at the "The View" restaurant. Here you can enjoy dishes such as grilled meats, spinach ravioli, steamed vegetables, green salad, fruit salad, dressings, mixed ceviche, sushi, Sashimi, paella, calamari, and cold meats. Come and enjoy the best balance between relaxation, adventure and comfort. NOTE: Do not miss out on our VIP PREMIUM experience which includes an exclusive menu served at the "Big Fish" restaurant. Here you can enjoy dishes such as shrimp skewers, grilled salmon, Teppanyaki and spend the day in a steamy Jacuzzi. This service will be available directly at the park at an additional cost. VIP Lounge (Infinity pool, lounge chairs y hammocks). Gourmet Buffet Lunch (restaurant "The View"). Lockers, showers, lounge chairs and towels. Use of kayaks, bicycles, lifejackets and snorkel equipment. Photos of your zip line experience. Dock Fee ($10.00 USD, paid directly at check-in). Access to our PREMIUM section (jacuzzi & restaurant). Exclusive area for adults available at an additional cost and can be paid at the park.